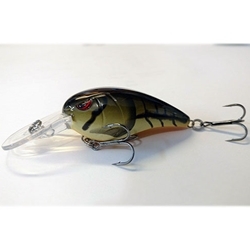 The Rk Crawler MD 55 crankbait was desighned by B.A.S.S. Elite Series Angler Mike McClelland. The RkCrawler MD 55 features all the benefits of the RkCrawler 55. With a shallower dive angle, this bait will be able to come through rock s more like a square bill crankbait to deflect off cover and draw more strikes. When the fish are shallower then 7 feet, the RkCrawler MD should be your go-to RkCrawler.